Numerous sources have reported the death of Cliff Robertson, an Oscar-winning actor with more than five decades in the business—a prolific career that was briefly derailed when Robertson inadvertently became the center of one of the biggest financial scandals in Hollywood history. Robertson died Saturday, only a day after his 88th birthday. Robertson so embodied the square-jawed, all-American archetype that he was often called upon to play soldiers, politicians, or wealthy playboys—and sometimes all three, as when John F. Kennedy handpicked Robertson to portray him in the 1963 movie PT-109. Most of that can likely be traced to his performance in the 1958 adaptation of Norman Mailer’s The Naked And The Dead; before that, Robertson landed a supporting role opposite William Holden in Picnic, starred in the campy Joan Crawford melodrama Autumn Leaves, and the lightweight musical The Girl Most Likely. But after Naked And The Dead, Robertson found himself typecast for decades in a string of war films that he, ever his harshest critic, would often deride as “mediocre” or “a bunch of junk” in interviews. Robertson’s fight to break out of the soldier mold, though admirable, didn’t always work. 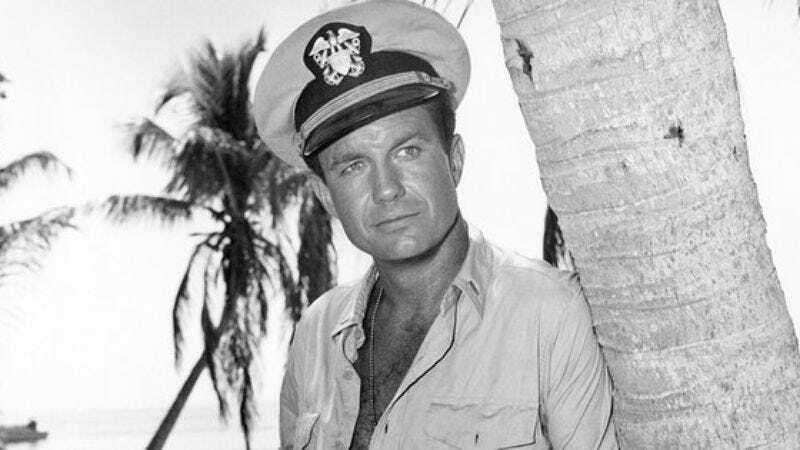 For instance, Robertson was questionably cast as beach bum The Big Kahuna in 1959’s Gidget, despite looking more like an oil company executive than a carefree surfer. He fared far better in 1968’s Charly (an adaptation of Daniel Keyes’ Flowers For Algernon), playing the mentally challenged title character who undergoes an experimental procedure to boost his intelligence. Robertson won an Oscar for the role the next year, and long after pointed to Charly as one of his crowning achievements—even attempting to drum up financing for a years-later sequel by shooting test scenes for it himself. He also upended expectations with his 1972 directorial debut J.W. Coop, a modern Western set in the rodeo circuit, with Robertson playing a former rider who has difficulty readjusting the world after spending eight years in prison. Though praised by critics, J.W. Coop was not a hit, and Robertson would later reveal that while he was working on it, he turned down the lead role in Dirty Harry—just one of several near-misses Robertson had with parts that eventually went to bigger actors. For example, he starred in Tennessee Williams’ Orpheus Descending on Broadway, only to see the role go to Marlon Brando when it was adapted as The Fugitive Kind. And while some have pointed to his performance in the original 1958 TV production of Days Of Wine And Roses as the superior version, there’s no question that more people remember Jack Lemmon’s Oscar-nominated turn in the 1962 film. After successfully exploiting his trustworthy, authoritarian image with a surprise sinister turn in Three Days Of The Condor, Robertson received plenty of attention—though it was nothing compared to the attention he would soon get for his accidental role in the 1977 scandal involving Columbia Pictures president David Begelman. It all began when Robertson received a note from the IRS regarding a $10,000 check he had supposedly cashed, with Robertson soon discovering that his signature had been forged. Despite being warned not to press the matter by many in the industry, Robertson filed a report that launched a widespread studio and even criminal investigation, eventually revealing that Begelman had embezzled more than $61,000 from the studio. All told, Begelman was fined $5,000 for his forgery and received an equally slap-on-the-wrist sentence for community service—and bounced back from being fired by Columbia by taking over MGM in 1980. Robertson, meanwhile, ended up being the scandal’s biggest victim, claiming he was then blacklisted and shunned by the industry for several years for daring to take on its powerbrokers. Nevertheless, after returning to film with 1983’s Brainstorm, Robertson was able to resume working steadily on both the big and small screen, landing a recurring role on Falcon Crest, playing Hugh Hefner in Star 80, and turning up in diverse films like Class, Renaissance Man, Wild Hearts Can’t Be Broken, and Escape From L.A. (where he played the President). And beginning in 2002, he became known to a whole new generation as Peter Parker’s kindly, wise Uncle Ben in Sam Raimi’s Spider-Man trilogy, whose reminder about the relationship between power and responsibility provides the series’ moral backbone—something that Robertson had done for so many years, both on-screen and off.